At the start of the new year, one of my favourite things to do is have a huge de-clutter especially of my wardrobes to make room for the new clothes I will undoubtedly be buying throughout the year. 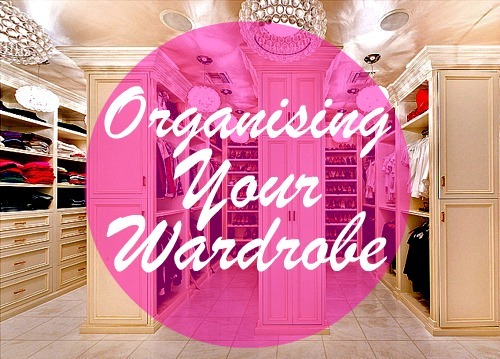 Step One // Organise any other clothing storage you have excluding your wardrobe (e.g. chest of drawers, ottoman) to make room for anything you want to store away from your wardrobe. Step Two // Sort through these clothes and ask yourself "Has it been worn in the last year?" "Will it be in here for another year?" If the answers are "No" and "Yes" GET RID either donate it to charity, sell it on eBay if its in a reasonable condition or bin it if its genuinely unwearable. Step Three // Now empty your wardrobe and ask yourself for each item "If I was shopping right now would I buy this?" If the answer is "No" chances are you'll never wear it so get rid. Step Four // As you're emptying your wardrobe place your clothes into piles for "Keep - frequent use", "Keep - evening wear, special occasions", "Keep - out of season", "Charity", "Sell" and "Bin". Step Five // Thoroughly clean your wardrobe to get rid of any dust that may be present ready for when you put your clothes back. Step Six// Now you've decided what you're keeping and what you don't want anymore, bag up the clothes you don't want and remove them from your room to make more space so you can see some progress. Step Seven // Now its time to put your clothes back - I like to put my out of season clothes into my drawers and ottoman and my everyday clothes and evening clothes into my wardrobe - I put everyday clothes at one side and evening clothes at the other. I hope these tips are useful especially if you don't know where to start when organising your wardrobe. I've just recently had a massive clear out of my wardrobe after losing 6 stone over the past 16 months so I knew I had to get rid of anything that was too big for me because i have zero intention of them ever fitting me again. Another thing i've done is turned all the coat hangers one way and then turn them another way when I've warn them.. the coat hangers that are still as they were in 3 months time I'm going to chuck them!